The ADA 120-H Cube Garden measures 120x45x60cm. The glass is 10mm thick on all 5 sides of the aquarium. I have been using the ADA 120-H Cube Garden for planted aquariums for about a year now. There are a lot of opinions out there on whether ADA’s products are worth the money that you pay for them. A few months ago I wrote a review of the ADA Layout Tools, you can read that review to see what I said about them. I finally got around to writing my comments on the ADA Cube Garden. I buy all of my ADA planted aquarium supplies from www.adgshop.com, and this aquarium was no exception. The aquarium came by freight and was nicely packed for protection. Shipping for these larger tanks is pricey, and requires you to work closely with the freight company to coordinate the delivery. My experience with Jeff Senske/ADG and the freight company he chose was pleasant, so we were already off on a good foot. There are quite a few things that set the ADA Cube Gardens apart from other aquariums that you purchase here in the United States. The first, and most obvious, is the lack of bracing that usually runs around the top and bottom edges of most aquariums. This type of design really offers quite a unique and clean look. 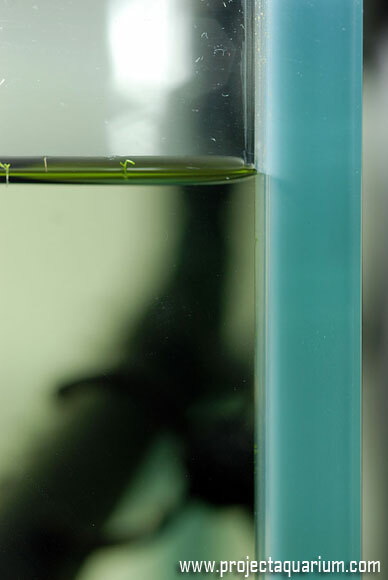 Without the edges we are not distracted while viewing the brilliance of our planted aquariums. 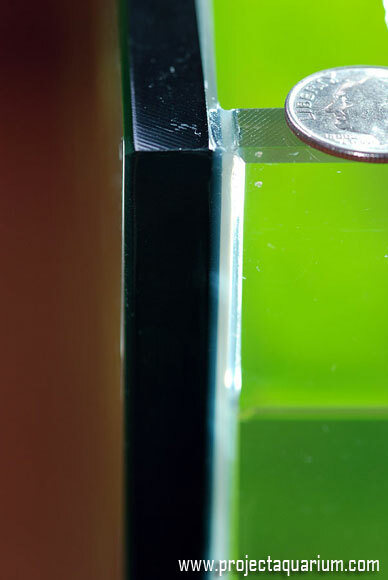 Fillets are the seams of silicone the bind the glass together into the cubes that hold water. ADA cube gardens are constructed in a way were the fillets are so minimal that you will often be left scratching your head wondering how they got these aquariums together with such strength. This approach is aligned with everything that ADA does. 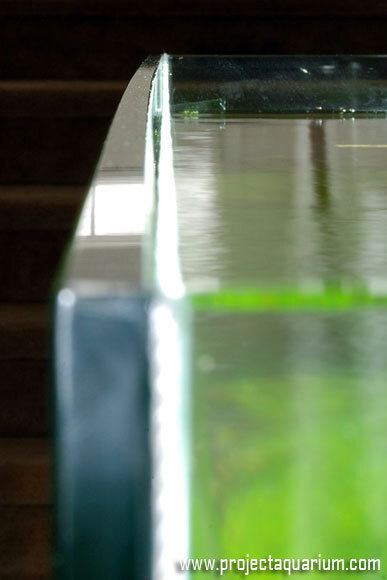 They create smooth classy designs that do nothing to distract you from your planted aquarium creation. These fillets are no different. Here are two examples of fillets. 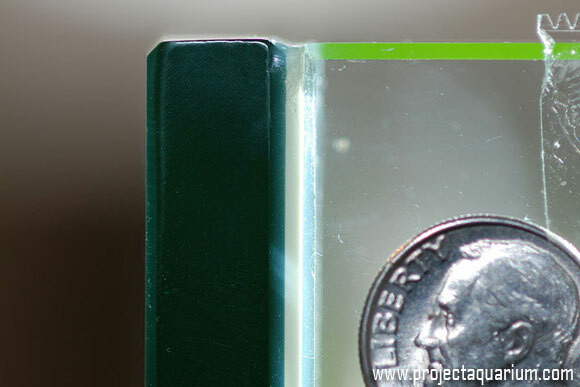 The first is a shot of a fillet from my ADA Cube Garden and the second is from my All-Glass 50 gallon (36x18x18”). I used a dime to create some scale. You can see how different the two fillets are. You can see the fillet on the ADA Cube Garden is only as large as it needs to be to keep the aquarium together. 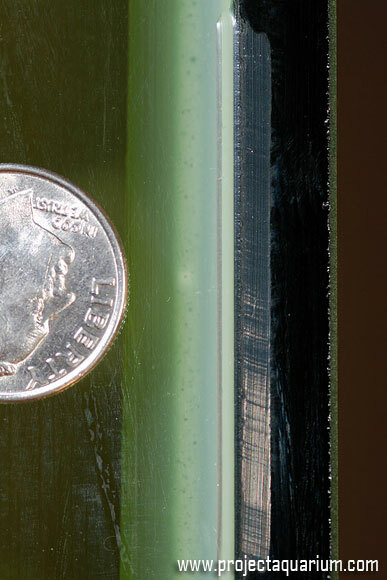 The All-Glass fillets reach past the joints by as much as a ¼ inch. All-Glass Fillet from the front. You can also use this picture to compare the ADA seam pictures below. Here is an example of the silicone seam on the ADA Cube Garden. This picture was taken from the front of the aquarium. You can see how the ADA Cube Garden seem is perfect with zero imperfections such as globs, bubbles or inconsistencies. 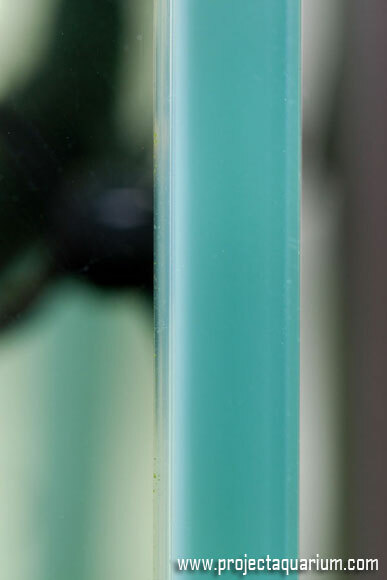 The All-Glass, shows imperfections in all three of these areas. You can see by this picture that all the glass panes are perfectly beveled to fit the over all beauty of the ADA line. Of course it bows!! Without the center brace, almost all of the ADA cube gardens will show some bowing, especially when we get into the aquariums that are 90cm or longer. ADA addresses the issue with using thicker glass then the US equivalents in size. You can see in these pictures below that the bow is really not that significant considering the amount of water that this aquarium is holding. You can see I use our trusty dime again to show scale. Also, note that I stretched a string across the length of the aquarium to further show the bow. Fillets – This goes hand in hand with the Rimless look. The minimalist fillets are just another step in creating a cleaner way to show your planted aquariums. Seams – All of the seems are perfect. The quality control at ADA must be border line impossible to pass. 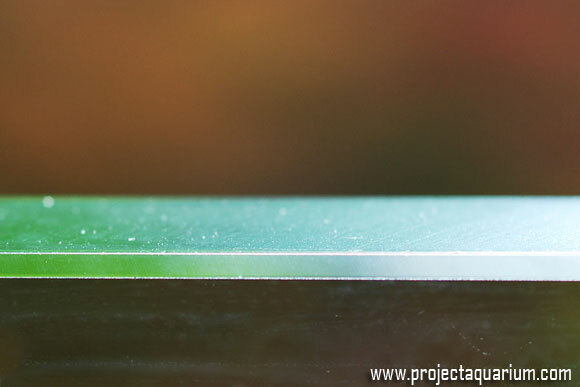 Glass quality – Nicely beveled and without imperfections. 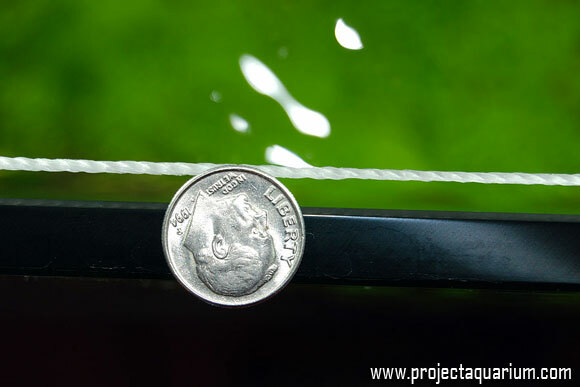 Price – The actual price of the ADA cube gardens is not that much more then standard US aquariums as long as the glass doesn’t jump to the 10mm thickness. The shipping is what causes the overall price of the ADA cube garden to seem much more. Also, once you jump to 10mm glass, the price does become pretty steep. Metric – All the ADA cube gardens are in centimeters. This poses and interesting challenge of finding a stand for these aquariums. The tanks that are 90cm and smaller are close enough to US version that you may be able to use US size stands. The larger ADA cube garden aquariums have a harder time fitting on US standard size stands. Another issue that must be talked about is the look. It is very hard to get an ADA garden cube and not want to complete the look with anything but and ADA style stand. I ran into this problem when I got the ADA 120-H Cube Garden. I put the aquarium on a few stands that did fit, however, none of them did the aquarium justice, so had no choice but to Build an ADA Style Aquarium Stand. As I noted to before, there are quite a few opinions around the value of the ADA line. When it comes to the ADA Cube Garden aquariums, we see an example of a product that is truly worth the money that you pay. They are pricey, but the quality and look is truly worth the inflated price that you pay for these aquariums. I love my ADA 120-H Cube Garden, it is a work of art, and further enhances the planted aquarium hobby and layouts I create.